Sidewalk Labs, which has committed $50 million to planning Quayside, as the development has been dubbed, could begin construction in 2019 if plans are approved. A potential mixed-use development in Toronto, spearheaded by a corporate sibling of Google, could provide a first-hand look at how autonomous vehicles can transform urban design and living. 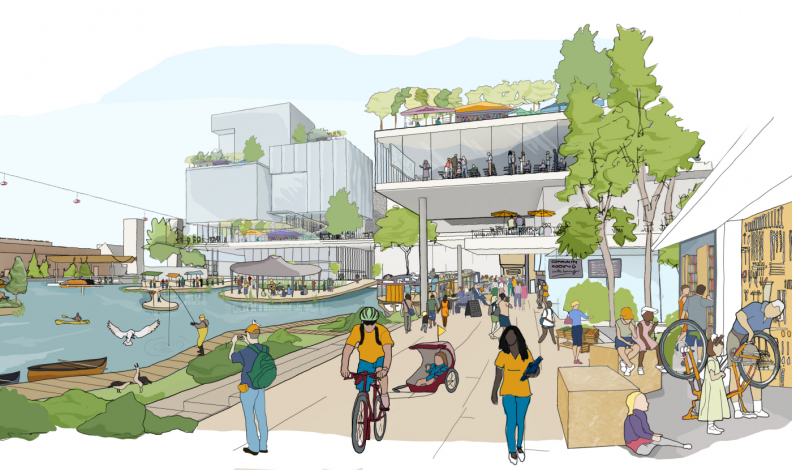 Sidewalk Labs, a division of Google parent Alphabet Inc., and the government agency Waterfront Toronto were tapped late in 2017 to plan the development of a 12-acre (five-hectare) plot of land just east of downtown near the Lake Ontario shoreline. Prime Minister Justin Trudeau, announcing the project in 2017, said he envisions the neighbourhood emerging as a “test bed” for new technologies that can transform urban living. Those technologies “will help us build smarter, greener, more inclusive cities, which we hope to see scaled across Toronto’s eastern waterfront, and eventually in other parts of Canada and around the world,” Trudeau said. And if Quayside, intended by Sidewalk as a showcase for how data-driven technology can make city life better, is ultimately seen as successful, the company has its eyes set on an adjacent 800 acres — 3.2 square kilometres — of largely empty, under-utilized real estate. There, Sidewalk Labs hopes to build what is essentially a city within a city, using data from cameras and sensors to make traffic flow, infrastructure, the electrical grid and other aspects of city life more efficient. Sidewalk Labs says the result will be a city that is better to live and work in. Autonomous vehicles are crucial to that vision, Aggarwala said. Sidewalk Labs, a sister company of Alphabet’s Waymo self-driving vehicle unit, ultimately intends to restrict transportation in the neighbourhood to cycling, mass transit and “taxibots,” a fleet of self-driving vehicles always on call. Restricting transportation to autonomous vehicles could allow street design in the neighbourhood to be radically different than in most major North American cities, where streets are designed around the automobile. “You can imagine a world that feels very much like the pre-automobile city,” he said. The plan faces several hurdles before it can come to fruition. For one, the initial development still awaits approval. And concerns over privacy, data-collection and safety are sure to provoke heated debate in public and among policymakers. Aggarwala said he’s confident Sidewalk Labs can win over skeptics.